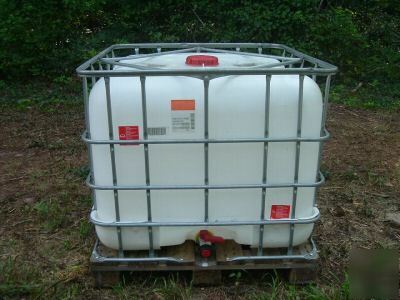 Â TanksÂ are made of plastic with a 3/4" metal tubing cage bolted on a removable wooden pallet. Â Dimensions are; 43" High, 45" Wide, 47" Deep, Inlet size is 6", Outlet is 2". Â 52 units will fill a 53' trailer. Please email for quotes on other quanities. I'll be glad to customize a listing for you.